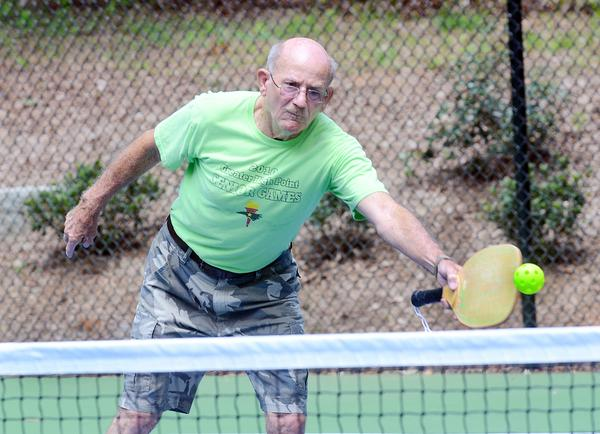 HIGH POINT — High Point resident Billy Warren may be 79 years old, but that doesn’t stop him from being the fastest player on the new outdoor pickleball court at Armstrong Park. “I’m the oldest one here and the fastest one here, and I play with two hands!” Warren said. Warren was one of the first people in the Triad to begin playing pickleball when a small group took up the sport at the Roy B. Culler Jr. Senior Center five and-a-half years ago. Now, residents in High Point and the surrounding area can play pickleball under the sun to their hearts’ content. Earlier this month, the High Point Parks and Recreation Department opened a refurbished tennis court dedicated solely to pickleball, only the second of its kind in the whole state. The first opened in Raleigh just a short time before the High Point court.